Convenient. Complimentary. And all the careful cleaning and care you expect from Wesch. Our personable, professional drivers will collect your laundry and dry cleaning from your home or office. Everything is returned to you as schedule – clean and Wesch Fresh. Pickup and delivery occurs twice a week at the address of your choosing. 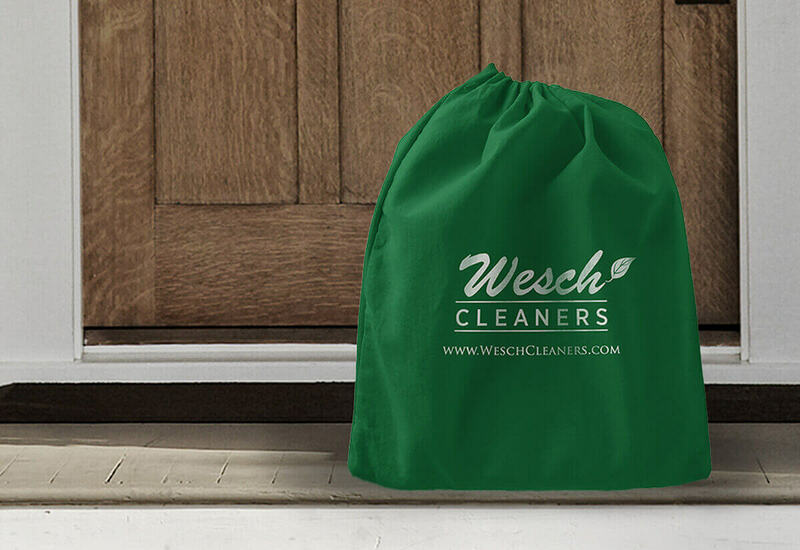 We’ll bring a reusable delivery bag to your home or office. Fill your delivery bag with the items you need cleaned. Place any special cleaning instructions inside the bag. Leave the bag where we can pick it up in the morning. We’ll pick up your bag at a pre-arranged time that works with your schedule. Your garments and other items are treated and cleaned with the same exceptional care we’ve provided for more than 75 years. Everything is returned to your home or office. Your credit card (required to sign up for the service) is billed and a statement is emailed. Ready for the convenience of our complimentary pickup and delivery service? Simply click the button below and complete the Pickup & Delivery form. We’ll contact you to set up a regular pickup and delivery time that suits your schedule. Not enough time in your day? Don’t worry. We’ve got this … in the bag.